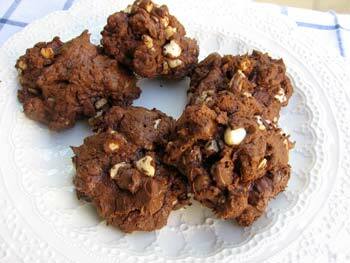 This is one of my favorite recipes for chocolate cookies. It makes chocolate cookies that are chock full of chunks of yummy goodness - chocolate chips, nuts, and plump dried fruit. It's definitely a cookie designed for chocolate lovers and is not for the faint of heart. If you're a fan of the Nestle Chunky candy bar with it's peanuts and raisins, you may especially appreciate the flavors and textures of this Chunky Chocolate Cookie recipe. I came across this recipe for Chunky Chocolate Cookies in one of my current favorite cookbooks, Baking: From My Home to Yours by Dorie Greenspan. It's a big, beautiful book full of well explained recipes for all kinds of yummy homemade baked goods. Dorie calls her cookies, Chocolate Chunkers. In the book she explains that they are based on cookies she made while working as a pastry chef for both Soho Charcuterie and Sarabeth's in NYC. You can play around with this chunky chocolate cookie recipe by varying the kinds of chocolate, nuts, and dried fruit you choose. I like a combination of semisweet chocolate, milk chocolate, peanuts, and raisins but you may prefer white chocolate, pecans, and chopped dried apricots. Feel free to experiment. I also prefer dutch-processed cocoa in this chocolate cookie recipe but use natural unsweetened cocoa if you prefer. Place an oven rack in the center of your oven and preheat the oven to 350F degrees. Line two heavy duty baking sheets with parchment paper or silicone liners. In a medium-size bowl whisk together the flour, cocoa powder, salt and baking powder. Melt the butter, bittersweet chocolate and unsweetened chocolate either in the microwave, on the stovetop or in a double boiler, whatever method you prefer. Be sure to do this gently just until the chocolate and butter melt and and the mixture is smooth and shiny. Don't let it get too hot or the butter will separate. In a large bowl beat the eggs and sugar together with an electric mixer on medium high speed until the mixture is pale and foamy, about 2 minutes. Beat in the vanilla and then scrape down the sides of the bowl with a rubber spatula until everything is blended well. Add the melted chocolate mixture and beat on low speed only until the mixture is blended together. Scrape down the sides of the bowl again to make sure everything gets fully mixed. With the mixer on low, add the flour mixture, mixing just until the dry ingredients are blended into the dough. Scrape down the sides of the bowl again and then stir in the chocolate chunks/chips, nuts and dried fruit. The dough will be very chunky! Drop the dough by generously heaping tablespoonfuls onto prepared baking sheets at least 1 inch apart. Bake the cookies one sheet at a time for 10 to 12 minutes. The tops should look dry but the interiors should still be soft. Remove from the oven and carefully transfer the cookies with a thin spatula to cooling racks to cool completely. This recipe yields about 2 dozen Chunky Chocolate Cookies. Chunky chocolate cookie dough can be covered in plastic and refrigerated for up to 3 days before baking. If once cooled, the cookies seem a little gooey for you, refrigerate for about 10 minutes and they will firm up. Chocolate Cookie Serving Suggestion: Chunky Chocolate Cookies are great on their own with a glass of milk, and are especially good broken up and stirred into slightly softened ice cream for extra delicious "Cookies and Cream." Recipe Source: Baking: From My Home to Yours by Dorie Greenspan.